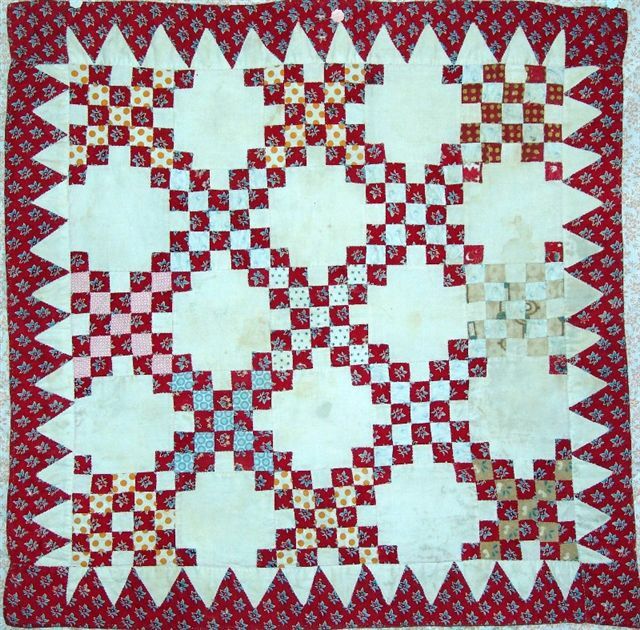 Inder Loves Folk Art: Quilt inspirations. I'm working hard on hand-quilting Joe's quilt. It's going slowly, but it is going. I definitely see this one being completed in less than fifteen years. So that's great news, since fifteen years from now, Joe will be too big for it. But hand quilting does not make for exactly exciting blogging. 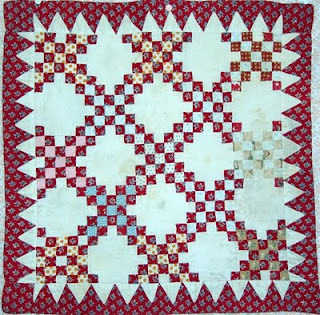 I don't know how the quilting bloggers keep up (granted, most of them machine-quilt, but still!). 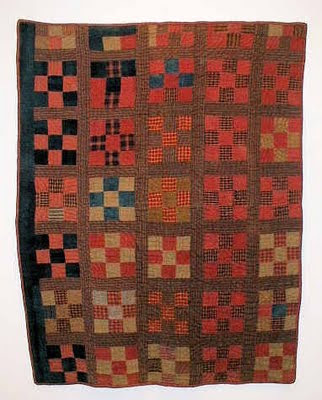 Hand quilting is said to be meditative. I counteract this to some extent by quilting while watching bad television, but I admit, there is a lot of mulling going on. One thing I've been thinking about lately is ... wait for it ... what kind of quilt to do next. I know, this is crazy talk, right? 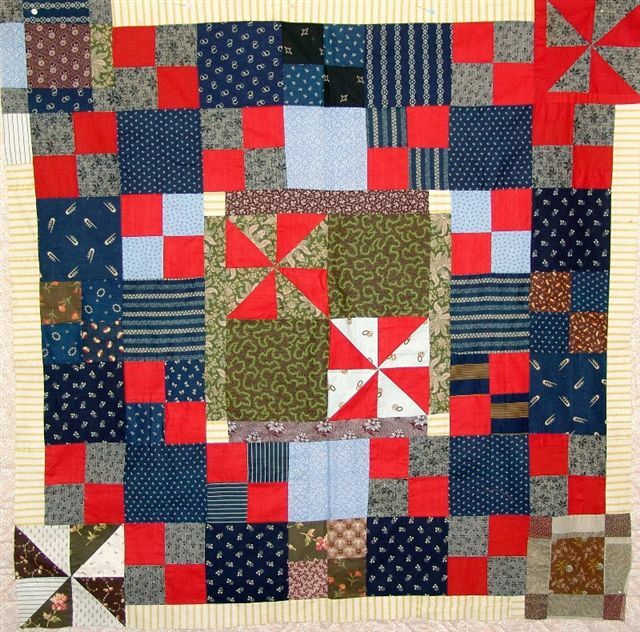 My first and only other quilt was very traditional in design (it used a simple nine patch and the "Ohio Star"). 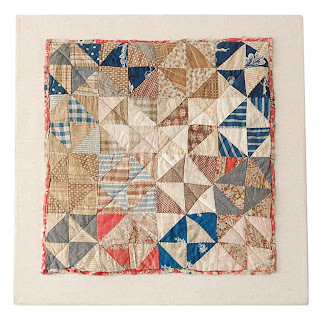 For Joe's quilt, I wanted something that would take me less than a decade to hand quilt, so I chose a simple, comtemporary design, Denyse Schmidt's "Flock of Triangles." It's a loose interpretation of the traditional "Flying Geese" pattern with a modern twist. The quilt below has a similar color scheme but it's traditionally hand quilted. I love the asymmetrical border on the left. 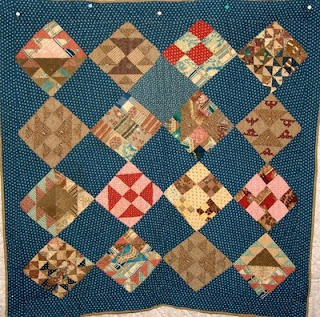 This may have been incorporated into the quilt because the quilter ran out of the tan sashing, or perhaps the quilt was intended for a bed that pushed against a wall, and the dark sashing was either hidden or decorative? If only quilts could talk! These little details fascinate me. I've also been poring over sweet little doll quilts. 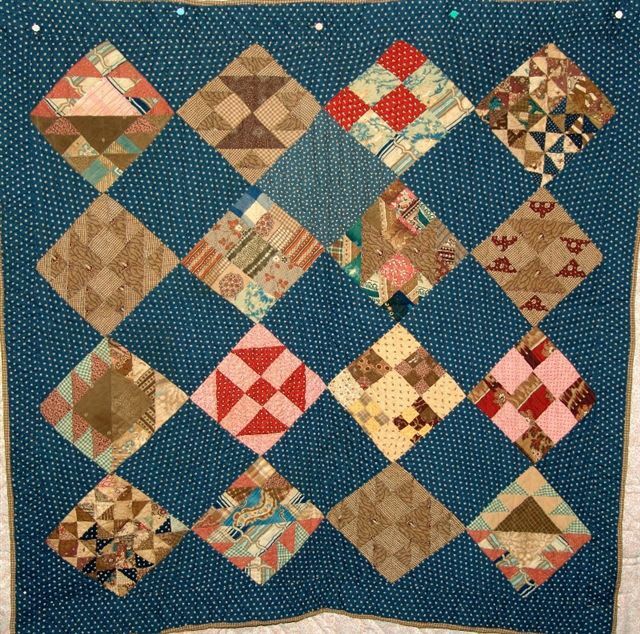 These were often made by little girls for their doll's cribs, and as a way to practice their needlework. 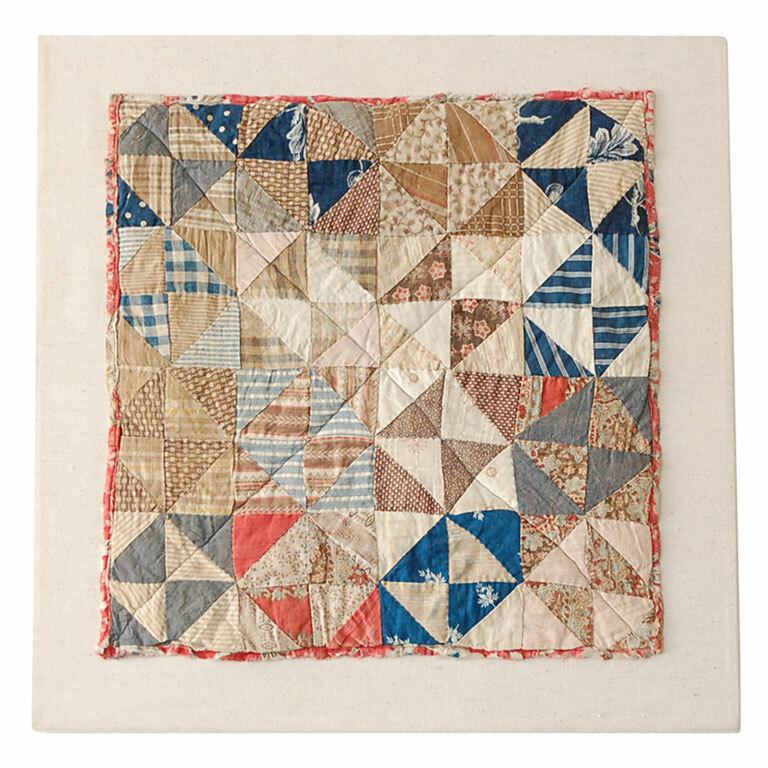 I think part of the appeal of these little quilts for me is that the quality of the stitching is a little closer to mine than quilts made by more skilled adult women! (Thus, they are not crazy-intimidating.) Also, they're cute! This is one of my favorites. Love those off-grain stripes. See here. The simple patterns, asymmetry, crude (although still better than mine) stitching, and proliferation of (sometimes off-grain) stripes and plaids in these little quilts actually gives them a very fresh, modern look, I think. Like this one. Isn't it spectacular? Did I mention this is a good web page for fans of 19th century child's quilts? So, my takeaway points from all this daydreaming while quilting: (1) There is a surprising amount of common ground between modern and traditional quilts, especially if you look at more utilitarian traditional quilts; and (2) I really, really like stripes. My next quilt will definitely have stripes. And it turns out even off-grain stripes look awesome. Maybe extra awesome. 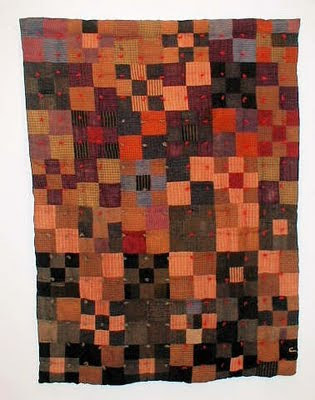 Some might call these quilts clumsy, but I think they are charmingly idiosyncratic. So if anyone wonders about my sometimes crudely large, crooked, and uneven hand quilting stitches, I'm sticking to my story. That's just part of the charm, folks. Now, back to my stitching! Ooh, I really like your inspiration quilts! I have 7 squares left for my hand-quilting, and guess what... I'm planning my next quilt too! I fell in love with the new Tula Pink 'Prince Charming' and since my Charlie loves frogs, made an online purchase of a frog print and two others. Now I have to figure out a pattern. I was just thinking of googling up some quilt pattern ideas when I saw your post! Thanks for sharing your ideas. I definitely like handmade-looking, wonky lines and all. Who wants to end up with something that looks like you went out and bought it? I don't quilt, so this may not mean much, but it looks like we have the same taste in quilts. I love the ones you display here. They look human-made, and that is beautiful. It lends them the emotional instensity that we usually look for in formal art. I guess it is good for you quilters that quilt-users like me exist out here in the world? People who love hand-made idiosyncratic quilts and can't make them for themselves?